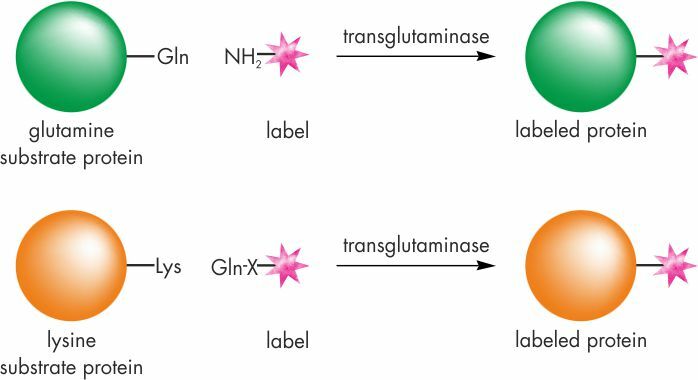 Protein labeling using transglutaminase (TGase) is a smart enzymatic labeling alternative to chemical protein labeling procedures. Protein biotinylation, PEGylation or site-directed protein labeling with fluorescent dyes are common applications of TGase labeling. TGases catalyse the acyl transfer reaction between the γ-carboxyamide group of protein-bound glutamine residues and the ε-amino group of protein-bound lysine or primary amines. Thus, primary amines as well as glutamine-containing peptides may carry a broad variety of labels like biotin, PEG or fluorescent dyes etc. 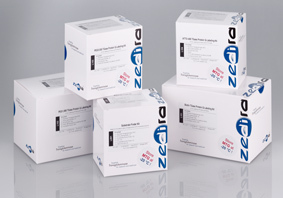 Please find information about TGase Protein Labeling Kits, the individual components and Zedira’s TGase Labeling Service in the respective categories. In case of any questions just contact us!